In 1763, British America was 156 years old—over a century and a half in existence. From a quarter million people in 1700, its mainland colonies had grown by a factor of eight, in seven decades, to over two million in 1770.1 Where England had been the new kid on the block in 1607, when Jamestown was founded, by 1763 the Kingdom of Great Britain was the dominant imperial power in North America. That year, with its victory in the French and Indian War, Britain gained all French claims on the continent—a vast area including Canada and the territory east of the Mississippi River. (Britain also gained Florida from Spain, but returned it after the American Revolution.) In this section we capture another snapshot of the British Atlantic colonies, this time from the 1720s to 1763. What overall view do you get of the colonies in these decades? How have they changed from the period 1690 to 1715 (see section #1). How has their relationship with Britain, and with each other, changed? To what extent have "they" become an "it"? Massachusetts. In section #1 we read a reviled governor defending himself against colonists' accusations of abuse of power (Gov. Joseph Dudley in 1708). Here we read from another embattled governor—Thomas Hutchinson, the last royal governor before the Revolution, a native-born New Englander deemed a traitor by the rebelling colonists (who looted his mansion while protesting the 1765 Stamp Act). During this tumultuous period Hutchinson published a history of the colony from its founding to 1749, later chronicling years 1749 to 1774. Here we read Hutchinson's perspective on the critical years 1760 to 1763, from the British defeat of the French in Canada to the final peace treaty which ceded all French territory east of the Mississippi River to the British. Although elated by the end of "encroachments" and attacks on their western frontier, the Massachusetts colonists bitterly resented the increased taxes and permanent military presence brought by the war. In a self-justifying tone, Hutchinson casts the British policies as reasonable for an imperial power in wartime, although he did not agree with all the British policies that led to rebellion. According to Hutchinson, how did the colonists' view of "independency" change from 1760 to 1763? - Thomas Hutchinson, The History of the Province of Massachusets-Bay, Vol. III: 1749-1774, ed. John Hutchinson (grandson), publ. 1828, excerpts. Pennsylvania poets. Pennsylvania was the fastest growing colony of the 1700s—and the most expansively diverse, commercially successful, perhaps best governed, and, as often lauded by its poets, the most confident of its future. "The generation of young poets that emerged during the 1720s and 1730s presumed this success," writes literary scholar David Shields, "concerning themselves with discovering those qualities of mind and character capable of projecting the 'great' Pennsylvania that came to be. "2 We read two works from this period, by accomplished poets Thomas Makin and George Webb, and a third by a young college student, Jacob Duché, writing in more troubled times during the French and Indian War of 1754-1763, when "Home-bred faction rends the sinking State / And Discord, Hell-born Fiend, trumphant reigns." Compare Duché's distress with Makin's and Webb's laudatory optimism. Also compare Duché's dismay with "restless Party-Rage" with Gov. Hutchinson's fear of colonists' "spirit of opposition" (above). And be sure to compare these three poems with Richard Frame's 1692 poem, "A Short Description of Pennsilvania" in the toolbox American Beginnings. - Thomas Makin, "A Discription of Pennsylvania," poem, 1728. - George Webb, "A Memorial to William Penn," poem, The Genuine Leeds Almanack for . . . 1730, publ. 1729. - Jacob Duché, "Pennsylvania: A Poem," 1756. Pennsylvania immigrant. In 1750 the German schoolmaster Gottlieb Mittelberger traveled to America with four hundred other emigrants. So distressed by the fate of many who were sold into indentured servitude by "Dutch man-dealers and their man-stealing emissaries," he returned to Germany in 1754 and published an account to dissuade others from emigrating to America. In stark contrast to this warning, however, is the second half of his book, a personal and often admiring view of Pennsylvania in the early 1750s. Here we present brief sections from the topics he surveys, including the colony's fast-growing population, its religious diversity and tolerance (and the "godless life of some people in this free country"), its open-doored courts for the common man, its capitalistic fervor and growing prosperity among free white colonists, the fashion sense of its wealthier citizens, and the arduousness of its travel. "There is a current saying," he writes, "to the effect that Pennsylvania is the paradise of women, the purgatory of men, and the hell of horses." - Gottlieb Mittelberger, Journey to Pennsylvania in the Year 1750, and Return to Germany in the Year 1754 . . . , 1756, excerpts. Virginia. Here we read another "review" of a colony by a European newcomer, in this case an Anglican minister called to Virginia to serve as a "Mathematickal Professor" in the College of William and Mary. Arriving in 1717, he returned to England two years later where he found that "few people . . . have correct notions of the true state of the plantations [colonies]." Thus in 1724 he published The Present State of Virginia, to inform his English audience of the colony's government, peoples, economic and religious state, etc., and to promote his plan to transport the English "poor and vagabonds" to Virginia as a non-African labor supply. How does Jones's emphases and structure differ from Mittelberger's (and from Bolzius's, below)? How does this affect the reader's impressions? - Rev. Hugh Jones, The Present State of Virginia, 1724, excerpts. Carolinas and Georgia. The Q&A format is not new to our times. In the colonial period it was a popular mode of publishing scriptural analysis, school lessons, political propaganda, and, in this case, information for Europeans considering emigration to America. Here we read from the all-encompassing Q&A compiled by Rev. Johann Martin Bolzius, the Lutheran chaplain to the Salzburgers (religious refugees from Catholic Austria) who founded the town of Ebenezer in Georgia (see GROWTH #3: New Settlers). He answers eighty-nine questions and vows "to come out freely about everything which I know about the advantages . . . and also to point out honestly the drawbacks to be found" in the southern colonies of Georgia and the Carolinas. To represent the full effect of this text, we list all eighty-nine questions with brief excerpts from each or, where most significant, the entire answers. Compare Bolzius's Reliable Answer with John Norris's Profitable Advice for Rich and Poor (1712, Carolina) in this section (#1) and with seventeenth-century Q&As in the toolbox American Beginnings. - Rev. Johann Martin Bolzius, Reliable Answer to Some Submitted Questions Concerning the Land Carolina; In Which Answer, However, Regard Is Also Paid at the Same Time to the Condition of the Colony of Georgia, 1750, excerpts. Overall, what impressions do you get from these readings of the British Atlantic colonies between 1720 and 1763? What are the most apparent and significant differences with the readings from 1690-1715 (GROWTH #1)? What aspects of colonial life and governance receive the most scrutiny from the writers? What positive aspects are extolled by colonists? newcomers? visitors? What negative aspects are of most concern to colonists? newcomers? visitors? What perspective would enslaved and indentured residents add to these appraisals? What issues might you have expected in these readings that do not appear? Why might this be so? How do the writers describe colonists of other religions or from other European countries? How do they describe Native Americans? African slaves? How does the goal of each writer affect his or her content? How does each reading include the issue of power? To what extent do the texts reveal a nascent sense of nationhood in the colonies? What texts reflect the colonies' resistance to unity? How has the colonies' relationship with Britain, and with each other, changed? To what extent have "they" become an "it"? How has the colonists' self-perception as British "subjects" changed? In the range from impartial analysis to blatant propaganda, where does each of these texts fit? What can be learned from each, regardless of bias and/or narrow audience? How do the texts differ by the authors' and illustrators' national identity? Do the men listed above (#17) differ more by socio-economic status, and by their political identity in the colonies (governor, minister, college teacher, college student, non-English newcomer, etc.) than by their status as native- or foreign-born? Whether yes or no, how would this influence your interpretation of these texts and drawings? How do the colony surveys by Hugh Jones, Johann Bolzius, and Gottlieb Mittelberger differ by emphasis, tone, and structure? How does each man address his audience? For what purpose? Compare Bolzius's Reliable Answer with John Norris's Profitable Advice for Rich and Poor (GROWTH #1) and with the seventeenth-century Q&As in the toolbox American Beginnings. How does the Q&A format affect the delivery of content to the reader? How might the Q&A format disguise bias? How might it encourage impartiality? Why is aspiring poet Jacob Duché dispirited with his fellow Pennsylvanians in 1756? Compare Duché's dismay with "restless Party-Rage" and Gov. Hutchinson's contempt for Bostonians' "spirit of opposition." Would they agree on the best outcome for the colonies? How do the maps convey British conceptions of their colonies' place in global politics? Compare the maps created during and after the French and Indian War (1754-1763), in which Britain gained from France a vast area of the North American continent. How is this victory apparent in the 1765 map? - How were the inhabitants' concepts of liberty and rights affected by the colonies' growth? - List the power relationships that influenced the colonies in this period, e.g., the colonies and England, the colonies and the French and Spanish on their borders, the settlers and the Native Americans, the clergy and their congregants, the southern planters and their servants and slaves, etc. How did the totality of these power relationships affect the colonies' growth and self-perception? 1 T. H. Breen & Timothy Hall, Colonial America in an Atlantic World: A Story of Creative Interaction (New York: Pearson/Longman, 2004), p. 257. 2 David S. Shields, Oracles of Empire: Poetry, Politics, and Commerce in British America, 1690-1750 (Chicago: University of Chicago Press, 1990), p. 39. - John Mitchell, A map of the British and French dominions in North America . . . , London, 1755. #G3300 1755 .M53 Vault. - Henry Overton, A map of the British plantations on the continent of North America . . . , London (? ), between 1755 and 1760. #G3300 1760 .O8 Vault. 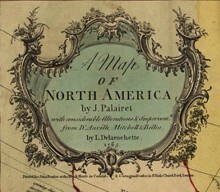 - L. Delarochette, A map of North America . . . , London (? ), 1765. #G3300 1765 .D42 Vault.